When you’re a mom-to-be it can be quite daunting to choose which products you will use when your new baby arrives. For me it seemed logical to choose Johnson’s since it’s a brand that has been around for a long time, over 100 years in fact! I used the baby wash from this top-to-toe range for washing Amy when we brought her home from the hospital. It’s a gentle wash that’s soap free, smells great, and because of the No More Tears formula it’s great for hair too. Trusting a wash to be mild enough for a newborn is a tough ask, but this is the wash they used at the hospital for bathing both Amy and Ethan, and I used it happily with both of my kiddies from day one and I haven’t been disappointed since then. I love the delicate smell it has, it instantly takes me back to the early days of nervously bathing my tiny new baby. The top-to-toe baby wash is available in 300ml for R39.95 but the 500ml for R59.95 is my choice because it features a pump that makes bath time washing that much easier. Plus it’s sporting a sleeker design which looks good. The Moisturising Massage Lotion from this Top-to-Toe range has become a new staple after bath time. I love the lightness of this lotion, and its fantastic fresh smell somehow just leaves your kids smelling really clean. It absorbs very easily and the light fragrance means it can be used for newborns too. It’s available in 200ml for 39.95 and 500ml for 59.95. Unfortunately, the bigger one doesn’t have a pump though. If it did I would be in bath time treats heaven. You can get a bit of extra nourishment with the extra moisturising baby cream if you choose. Being a cream it’s a bit thicker, but is just as easily absorbed and good-smelling as the lotion in this range. It’s only available in 100ml and costs R24.95, but I found it the perfect size to pop in my nappy bag for when you’re out and about or for any away trips, and as an added bonus it even doubles as a hand cream for me. The massage oil is 39.95 for 200ml and works well for massaging baby after their bath. Spending time massaging your new baby is a great way to bond with them, and it’s best to enjoy this special time before they become too wriggly. As if you needed an excuse to rub those precious little toes and tiny fingers. It comes with a child-proof lid so you can send your toddler to fetch it and not be worried about any spills, as well as a handy spout which ensures you don’t get too much at once. Johnson’s research shows that a baby’s skin is still developing and fragile, and as such its different to adult skin. It’s 30% thinner, loses moisture up to two times faster, and is affected by dryness from as early as three months. That’s why it’s important to use special cleansers and moisturisers on our babies rather than adult products to ensure their delicate skin is protected. The new top-to-toe range is the perfect way to make sure you’re taking care of your baby’s skin needs after bath time. 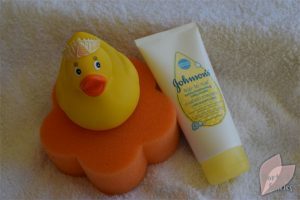 If you’re a mom-to-be you can stock up and rest assured that you’ve made a good choice, and if your babe is now splashing in the bath with their yellow duck then it’s worth adding to your bath time routine if it isn’t already a part of your care collection. With Johnson’s top-to-toe range you simply can’t go wrong. 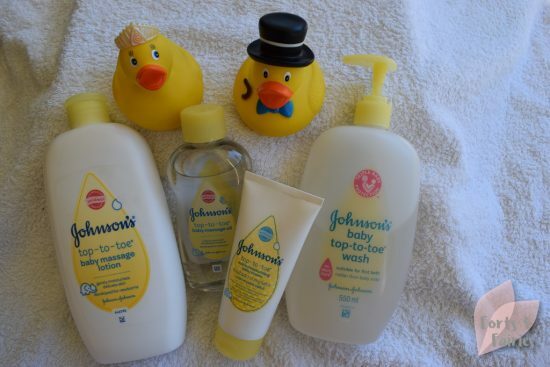 Thanks to Johnsons for the review products, and for giving us a trip down memory lane with their sweet smelling baby wash.